Clang! Bang! A family awakened at midnight. Why? A raccoon was feasting on leftovers in their garbage cans. These black-masked, furry bandits have nimble fingers that pry open just about any container. Raccoons are good problem solvers and even open latches and turn on faucets. Another neighborhood family wondered why their cat’s food bowl was always empty and their cat was always hungry. The mystery was solved when the father came home late and his car lights caught the raccoon eating cat food. Curious raccoons get into all kinds of trouble—and fun! Our Creator, God, gave raccoons thick grayish hair and a bushy tail with five to seven rings. God placed a black, striped mask across each raccoon’s eyes to cut down on the glare of light. These mammals hunt mostly at night. They have an excellent sense of smell and touch to help them find, catch or pick up food. Raccoons live in almost every state in the USA. In wooded areas they make nests in hollow trees, logs or stumps. No trees? No problem! High grass works, too. A Minnesota trapper even found 23 raccoons in an abandoned cabin. These lively animals usually live near ponds and streams. They like to live close to people. Curiosity overcomes their shyness. They regularly visit homes where food is left out for them. People may keep them as pets because they can be trained but that’s not always wise or even allowed. Older raccoons can develop tempers and scratch and bite. Many farmers call raccoons pests not pets. 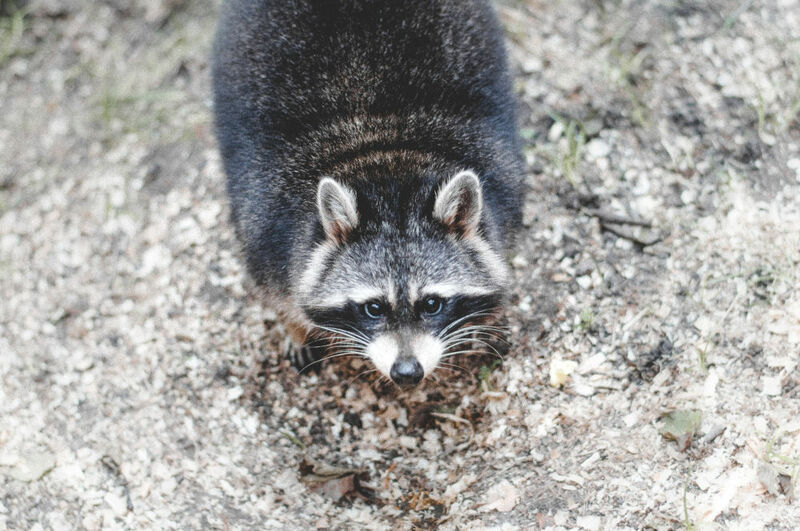 Farmers might welcome raccoons if they ate only grasshoppers and other crop-eating insects. But they don’t; they eat farm food, too! A hungry raccoon looking for eggs can totally upset a chicken coop. Raccoons might also raid farmers’ corn supplies to get a tasty treat. The name raccoon comes from a Native American word meaning he scratches with his hands. Part of its scientific name, lotor, is Latin for washer.